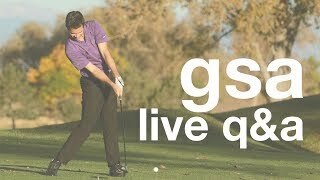 Live Q&A: Short Game Common Complaints - April 15, 2018 Discussing member questions related to short game. Live Q&A: Transition Faults and Fixes - April 29, 2018 Discussing member questions related to the transition. Live Q&A With Tyler Ferrell - Dec 7th, 2017 Discussing member golf-related questions. Live Q & A - Big Moves - March 18, 2018 Discussing member questions about the big movements of the golf swing. Live Q & A - Big Moves 2 - March 25, 2018 Discussing member questions about the big movements of the golf swing.